Prince George's County elections officials say they're changing the way they predict voter turnout after dozens of precincts ran out of paper ballots during the November election. 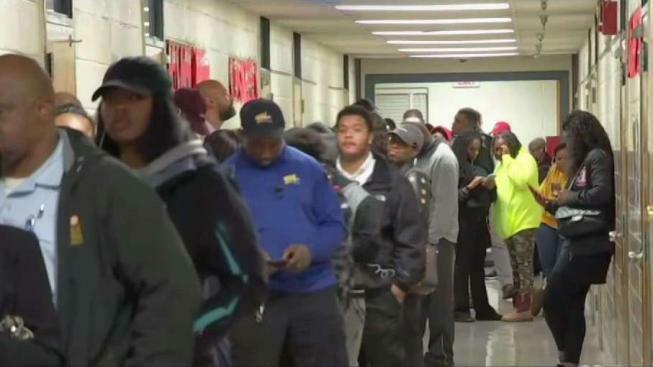 The shortage left hundreds of voters standing in line hours after the polls were supposed to have closed and ultimately delayed the reporting of results statewide. Among the changes: Elections officials will no longer use prior voter turnout to predict the number of ballots needed for each precinct and instead will consider the number of registered voters assigned to each polling place. Prince George’s County elections officials have previously said they anticipated higher turnout this year than the typical midterm election and therefore used the 2016 presidential election turnout as the basis for the number of ballots it ordered. However, it still fell short. The report confirms nearly 30 precincts ran out of paper ballots. The News4 I-Team reviewed the ballot allocation numbers for each and found some of those only had roughly 30-35 percent voter turnout. According to the report, poll workers will now be required to monitor and document the number of ballots the precinct has on hand so they know when to request more. Other ideas include having specific point people to receive and expedite all ballot requests to make sure the response is immediate. Elections officials will also work with law enforcement on potential traffic solutions in the event additional ballots are needed during rush hour — an issue officials say delayed the delivery of additional ballots in November. Maryland Comptroller Peter Franchot lambasted Prince George’s County's performance during a recent Board of Public Works meeting. He was one of many state officials awaiting Prince George’s review of its ballot problems, and in an interview with News4, he called the proposed changes common-sense. "Each event that happens like this is very corrosive as far as the public’s trust and confidence in the system," Franchot said. “Hopefully we will improve,” he added. The head of Prince George’s elections couldn’t be reached for comment this week, but the report also indicates elections officials will begin a series of “lessons learned” meetings in January.